You will need to Freeze Some bananas & strawberries overnight to get the “ice-cream” texture you desire! Put the Date, bananas & strawberries into the blender and pulse for a bit so they break up! 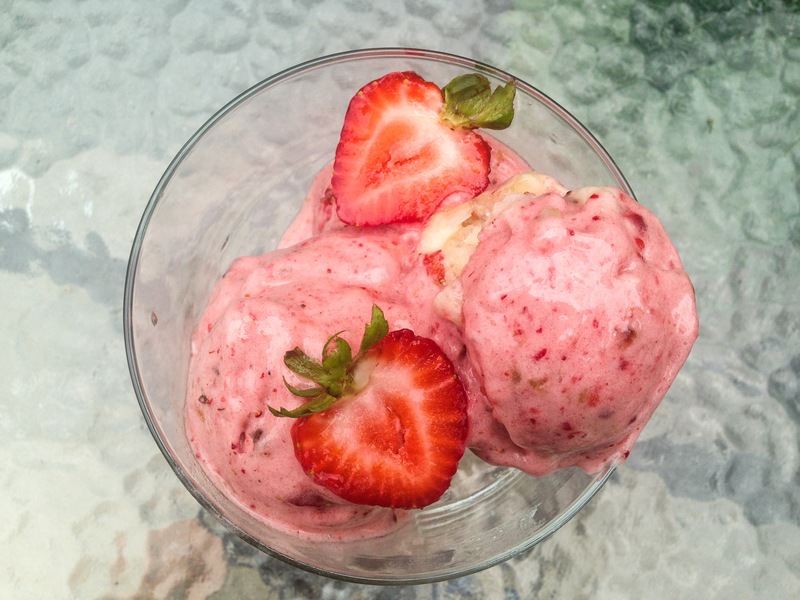 Pour or scoop your Strawberry Banana icecream in a serving dish and ENJOY! Dates are awesome, aren’t they? I’m sure they’re great in your ice cream, but have you ever tried them in a smoothie? Sometimes I use them to sweeten it a bit if it needs it. I’m with you, not a fan of refined sugar. Dates in a salad dressing would be awesome (and I think you posted a lemon one that I wanted to try, but haven’t yet). I’m certain the possibilities are endless! Mee too 🙂 I actually made a recipe for kale salad once and I made a lemon – agave viniagrette, maybe I’ll try it with dates next time! OMG the first time I discovered frozen bananas make the BEST healthy natural ice cream… Oh man. I had it for the first time in Dubai. Served with date syrup, cocoa nibs and a bit of peanut butter. yum!!! ooh that sounds amazing 🙂 I know frozen bananas are awesome!!! enjoy! Oh dates in ice cream I’ve recently rediscovered them and they are very versatile. Great recipe with s twist thanks for sharing. thanks for reading 🙂 I have been using dates for everything! haha even to sweeten my food dishes! enjoy! Oooh this looks yummy! Great idea to put a date in there. I will have to try that! It makes it extra delicious 💜enjoy!